bait well. The bow can be reached by a large walkway and has a comfortable second fishing station. the driving station and can be converted to a temporary berth, with a marine toilet on option. is easy to maintain and will never go out of fashion. but is only 5.52 m long. She is fun, agile and robust, with every fitting optimized and a large selection of options. With the pilothouse opening on the starboard site it is easy to circulate on board. Two side bench seats can be added to the removable bench aft of the cockpit, offering greater comfort to the crew at anchor or underway, while providing plenty of open space for fishing. 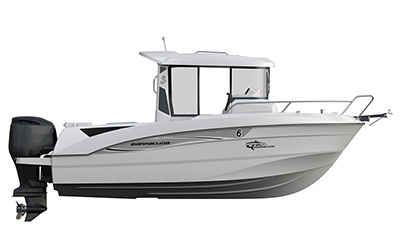 The Barracuda 6 comes with a choice of three different engine types - 90, 115 and 140 hp – matching the power needed for whatever the intended programme and stretch of water.